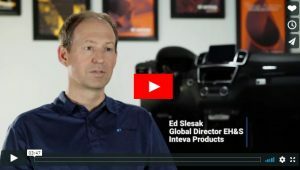 ANN ARBOR, Mich., Nov. 13, 2018 /PRNewswire/ — VelocityEHS, the global leader in cloud-based environmental health and safety (EHS) and sustainability solutions, is proud to feature Inteva Products, one of the world’s largest automotive suppliers, in a new Humantech client success video about Ergonomics done right.® Inteva Products uses VelocityEHS’ Humantech System®, to manage ergonomics among its 50 worldwide locations to reduce the likelihood that employees will develop musculoskeletal injuries. Headquartered in Troy, Michigan, Inteva Products manufactures automotive parts, including sunroofs, interiors, and door latches. With over 12,000 employees, implementing a consistent, sustainable ergonomics process across multiple languages and cultures was a challenge. The Humantech System has helped. “It ensures we are following the same process to complete assessments and using the same methods for evaluating our work processes no matter where we are in the world,” says Global EHS Director Ed Slesak. “Improving the operations for operators and making things more efficient is key,” says Engineering Manager Gini Mitchell. The Humantech System identifies where the risk is and provides the ability to track, record, and measure risk across the organization. The engineering groups are also using the system’s built-in ergonomics design guidelines to “design-out” risk in new jobs and production lines. Inteva Products first launched The Humantech System in the United States. Once the company established the system’s effectiveness, they implemented it across multiple international regions. “The Humantech System has made my job easier and has made our company safer,” says Slesak. Watch the full video on the Humantech website. Trusted by more than 13,000 customers worldwide, VelocityEHS helps you reach your EHS goals faster with quick implementations, affordable solutions, and unparalleled customer support. We deliver a comprehensive cloud-based environment, health and safety (EHS) software platform. Our easy-to-use software applications are designed based on industry best-practice principles to help you solve complex business challenges in simple ways. Recognized by the EHS industry’s top independent analysts, including leading scores in the Verdantix 2017 Green Quadrant Analysis and 2017 NAEM EHS & Sustainability Software Ratings Report, VelocityEHS is the global leader in cloud EHS software solutions.